Wonderful article, and especially helpful in putting our ancestors in perspective for those of us doing genealogical research. I remember when the rule at my public school was changed, allowing girls to wear pants (5th or 6th grade/1970-ish). I was the ONLY–very lonely–girl to wear pants the next day and felt like a fish out of water, but the Administration/Teachers went out of their way to reassure me. 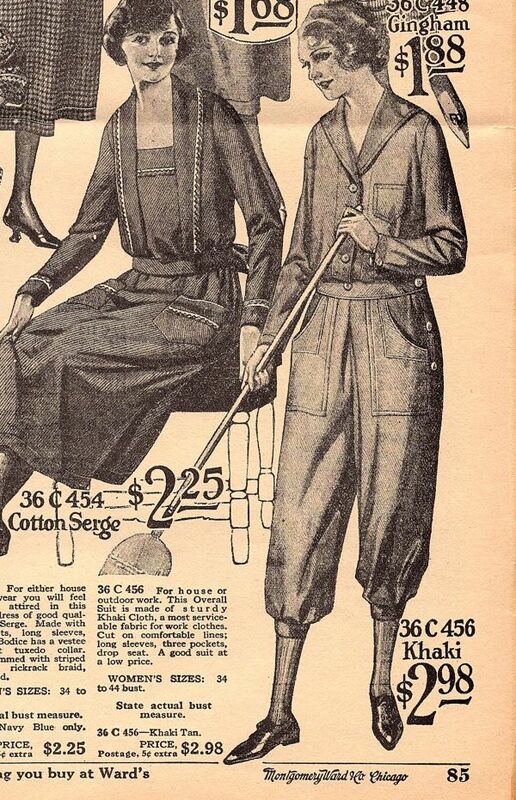 In some ways, pants were more modest than the dresses worn over shorts. The Women’s Liberation Movement is really responsible for the larger portion of society accepting women in pants in the workplace. In talking with some older ladies who worked in department stores at that time, they were required to wear tops that covered their derrieres/bums for modesty’s sake, hence the pantsuit. I was a junior in high school (1971-2) when girls and women teachers finally were allowed to wear pants. The new rule mandated tunics over pants, but we paid little heed, and it wasn’t enforced. When I went back into the public schools as a teacher in 1977, I was reminded of the rule, and actually written up for not following it! 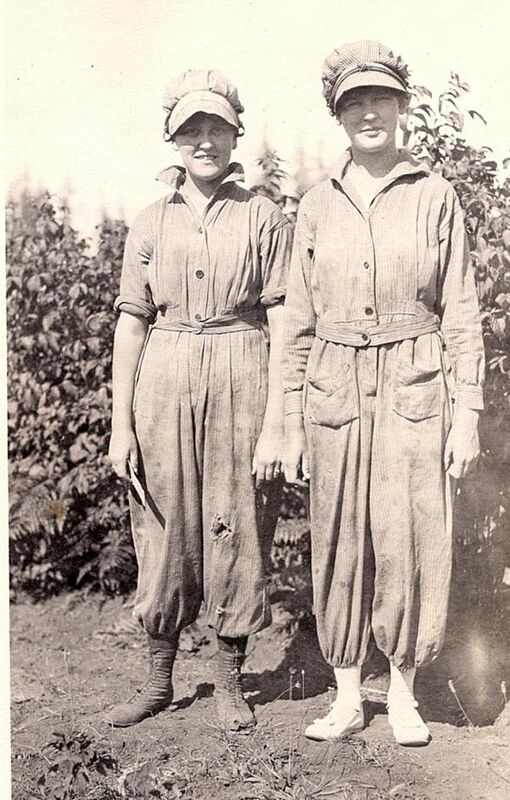 I’ve seen some fairly early photos (pre-1900) of woman on farms, and those working in mines wearing overalls or pants, but the one above (1915-1920ish) is the earliest one I’ve actually found for my collection. People wanted to be photographed at their best, not wearing work clothes! 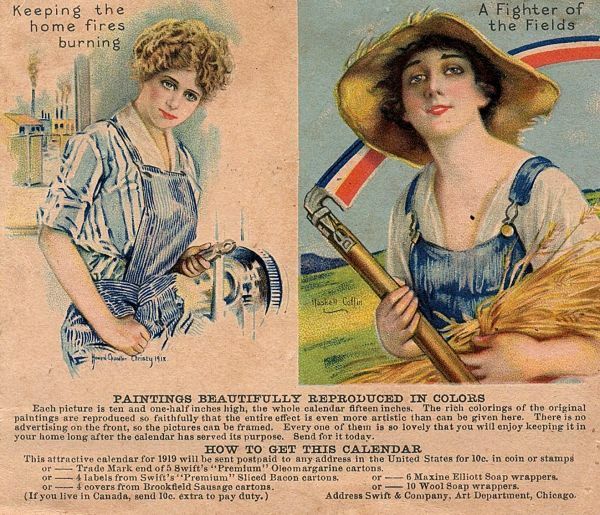 I always wish the museum collections showed more working class clothes, but of course, those clothes were literally worn to rags. (In London, in the winter of 1978, you could still see workers on road crews, or painters and stonemasons, working outdoors in old tweed jackets, layers of sweaters, and mufflers.) Luckily, specialized museums sometimes have work clothes. Well, similar minds think alike! I photographed all the overalls I could find in the Montgomery Ward catalogs from 1900 to 1950 and will do a post on them soon. It was interesting to see what changed…and what didn’t. Another aspect of the overall suits pictured: if you cover up the outfit below the hips, these could be typical house dresses of the period. It seems logical then that the transition into bifurcate wear required the adoption of pants that were less obvious, with a silhouette that remained within the confines of the current fashion silhouette. Much less embarrassing to wear, I’d think. For anyone interested, the WWI connection is also noted there, but you’ll have to excuse the cheeky title, which was inspired by somebody who was still a bit upset about something we now regard as so routine.